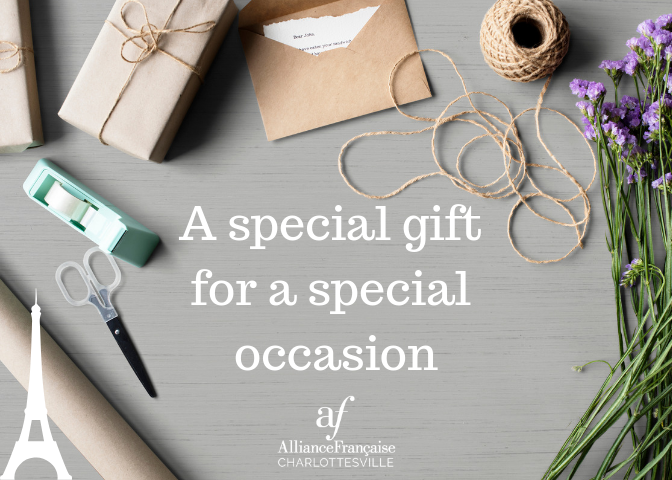 Give the gift of French! A birthday, holiday, wedding or retirement party coming up? Looking for a useful, out of ordinary present for a special occasion? We got you covered with the AFC gift certificates! AFC gift certificates are available for any amount of your choosing and can be redeemed for AFC classes (group or private) and membership. They are available for purchase at our office, 700 Harris Street, Suite 105, Charlottesville, VA, 22903.